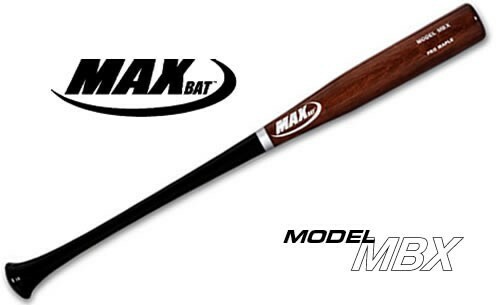 The most popular new baseball bat in the Majors is now available from MaxBat. The Pro Model MBX has a tapered 15/16” handle which flares into its trademark knob. The enlarged knob acts as a counter weight to the 2-1/2" barrel, making the maple MBX well balanced in your hands. The flared handle is also designed to protect the vulnerable hamate bone from bruising. Available in over 500 color combinations and up to a -2 oz. weight to length difference. All custom MaxBat maple bats are made from the best wood, to the high standards today's professional baseball players. Every MaxBat features free laser-engraved personalization.